You’re not the only one who loves Cincinnati—termites do, too. The city is an attractive home for these nasty critters due to our diverse weather and abundance of wood buildings. Unfortunately for homeowners, termites can destroy the structure of a house over time, potentially costing thousands of dollars in renovations if the infestation goes unnoticed. Every homeowner in Cincinnati should learn what they can about avoiding, identifying and resolving a termite infestation. In Ohio, the most common type of termite you will encounter is the subterranean termite. Subterranean termites require moisture to survive, so they typically burrow into the soil. Once underground, these termites create narrow tunnels in the soil that enable them to travel great distances in search of food. The subterranean termite’s favorite food is the cellulose found in wood. Although termites can and do feed on wood in nature, such as tree roots and stumps, they’ll dine on the wooden parts of your home, especially if access is too easy. This usually occurs when termites are feeding near a home and wood is too close to the soil or the foundation is wet enough to provide the termites with the moisture they need to survive. The termites begin feeding at the bottom of the home, but they will eventually work their way to the upper levels as they tunnel through the wood. After finding a source of food in the home, termites may also tunnel through nonfood substances, such as plaster or insulation. Mud tubes found on the exterior of the home. Termites build aboveground “tubes” out of mud to protect their tunnels and food sources. Evidence of shed wings. Termites periodically shed their wings, and the remnants are often visible outside the home. Signs of wood damage or rotting wood. When a termite infestation progresses, you may notice wood damage or wet, rotting wood on the interior or exterior of the home. Visible termite presence. In some cases, you may see the bugs themselves either inside or outside your home. The best way to deal with a termite infestation? Prevent it. If you find evidence of a termite infestation on the interior or exterior of your home, rectify the problem as quickly as possible to prevent further damage. 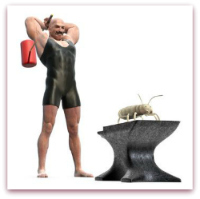 Call a local home inspector or exterminator. When the inspector arrives, he will carefully evaluate your home and assess the amount of damage the termites have already caused. If the termites have already caused serious structural damage to the property, repairs may be necessary. However, if the damage is only minimal, you can rest easy as soon as the infestation is under control. After your home has been treated, have it re-evaluated to ensure the termites are truly gone.